Billet Dipstick Cover 02-up Dodge, Chrysler, Jeep T Handle Billet Dipstick Cover 02-up Dodge, Billet Dipstick Cover 02-up Chrysler, Billet Dipstick Cover 02-up Jeep, Billet Dipstick Cover 02-up Gen III Hemi, Billet Dipstick Cover 02-up Mopar 4.7L, Billet Dipstick Cover Mopar 3.5L,02-up Billet Dipstick Cover Mopar [American Brother Designs 3217DS] - $79.95 : 3rd Strike Performance, Your Source for Late Model MOPAR Performance Parts and Accessories! 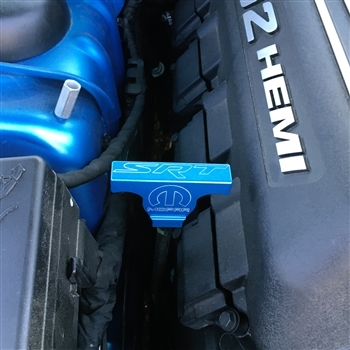 Mopar licensed Dip Stick Handle Cover. Professionally machined and painted, made from premium billet aluminum and finished with a durable paint coat as sleek and beautiful as the one on your Dodge, Chrysler or Jeep. Installs within minutes and made in the U.S.A. by American Brother Designs. Must have T Style Dipstick from factory.